Rimini - developed tourist destination and the largest Italian resort on the Adriatic coast. 9 kilometers from Bologna city center is the international airport of Bologna Guglielmo Marconi airport or airport Bologna. Attractive airport, primarily because it serves local and international flights, including budget airlines (low-cost): Ryanair, Wizz Air , Pegasus, etc. whereby to reach from many European cities to Bologna and the surrounding area is possible at very attractive prices. Cheap flights to Bologna see here. 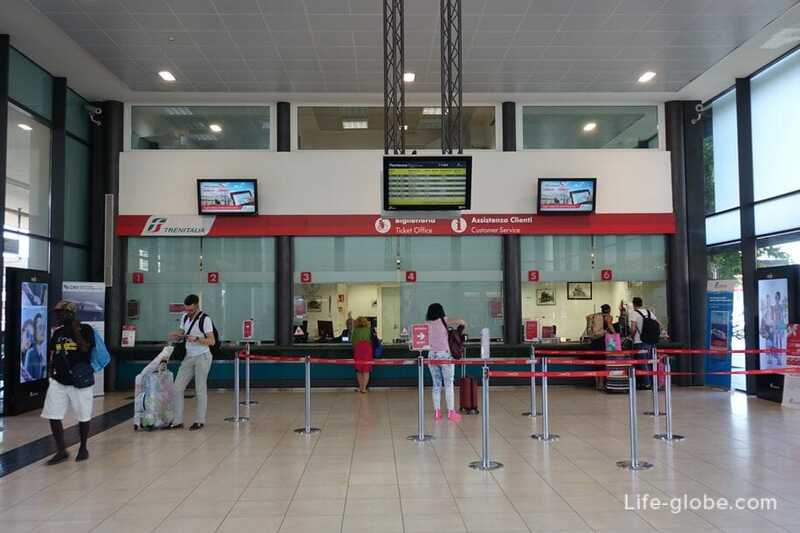 To get from Bologna airport to Rimini more convenient and faster than a taxi. To order a taxi/Shuttle service in advance, even from home. At any time of the day, at the airport, you will meet your driver with a sign, which will be written your name and surname. For taxi is enough to tell us your flight details! The most convenient way of independent movement in Italy is a car. You can rent a car in advance, even from home, the car will be waiting for you immediately upon arrival at the airport. Car for rent can look and book here, the rent is quite reasonable, starts from 21 EUR per day. The Shuttle bus is the only public transport on which you can get from Bologna airport to Rimini (as well as from Rimini to Bologna airport). 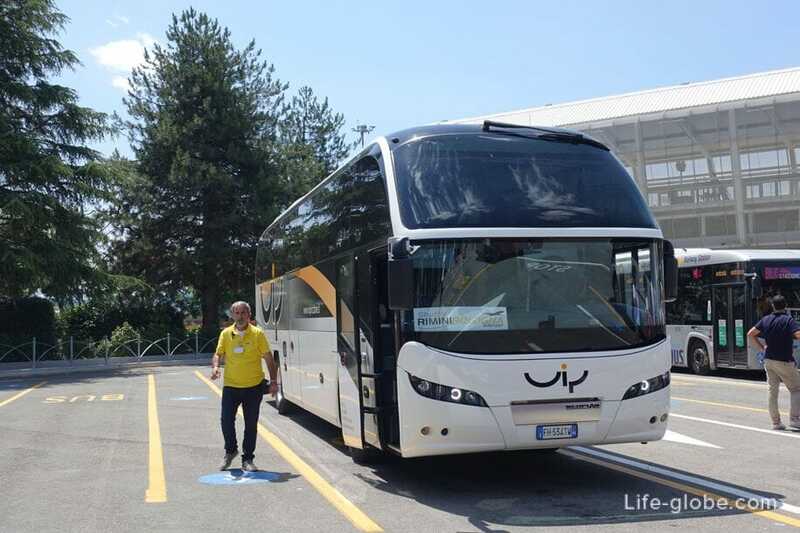 Shuttle buses leave daily from Bologna airport to Riccione, through Rimini. 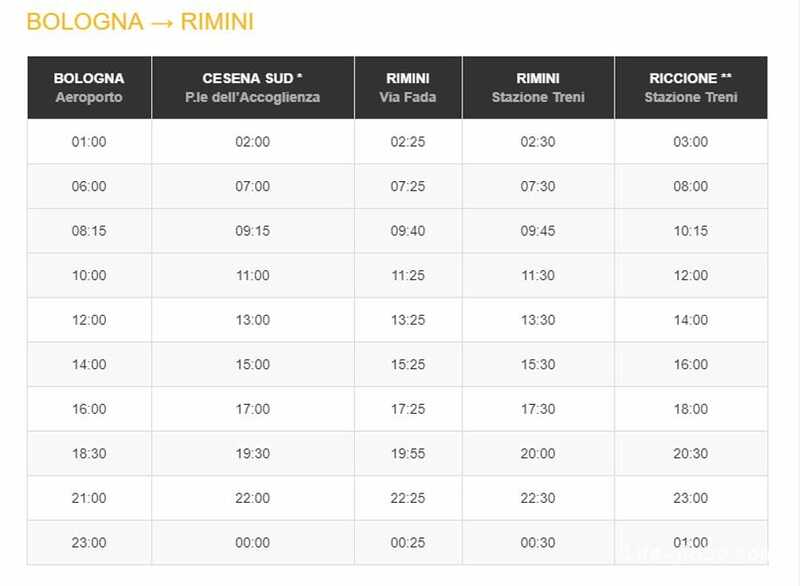 The airport bus takes you to the centre of Rimini, about 1 hour and 30 minutes. Tickets can be purchased online on the official website of the carrier, the driver on the bus or in affiliated agencies. - if you purchase tickets online or at the Agency: adult ticket - 20 Euros, children from 5 to 10 years - 8 Euros, children under 4 years stay free of charge; additional baggage 10 Euros. - if you buy tickets in the bus: adult - 25 Euro, children from 5 to 10 years old - 10 Euro, children under 4 years – free; extra Luggage is 15 Euros. Stop at the airport of Bologna is located to the left from the Central exit of the airport. Exit, turn left and go to end. Here is the bus schedule. In Rimini the bus makes two stops. The first is called the RIMINI Via Fada and is not in the center of the city. 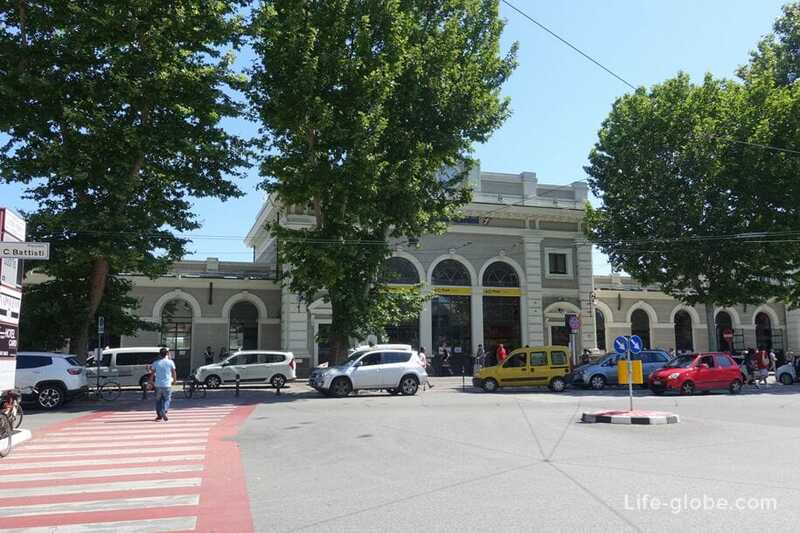 The second and most popular is located opposite the train station of Rimini. 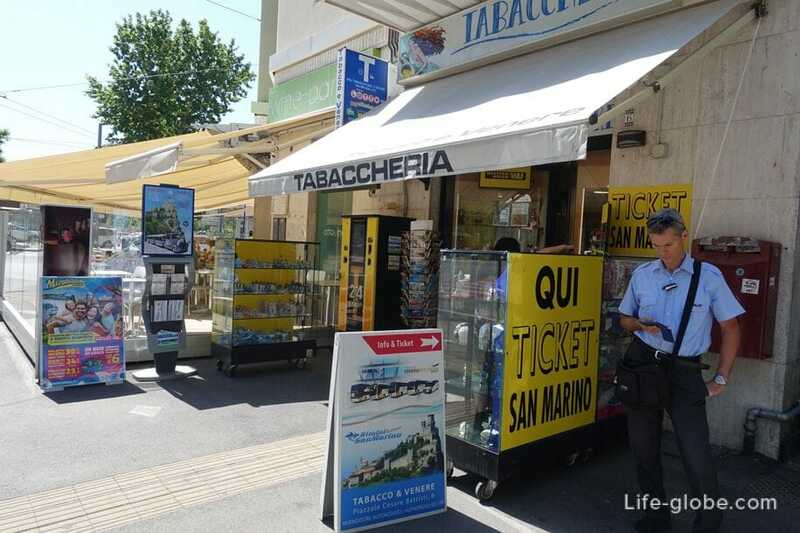 In Tabaccheria near the bus stop you can buy tickets. - 4-star FlyOn Hotel & Conference Center with its own garden, located 1.5 kilometers from Bologna airport. It offers a fitness centre and free Parking. The rooms are equipped with air conditioning and a TV with satellite channels. Featuring a private bathroom with a bath or shower. In some room rates include Breakfast buffet. - 3-star hotel Brianza, located 1.8 kilometers from the airport. It offers non-Smoking rooms with satellite TV and free private Parking and Wi-Fi. Facilities include a TV lounge and a bar. 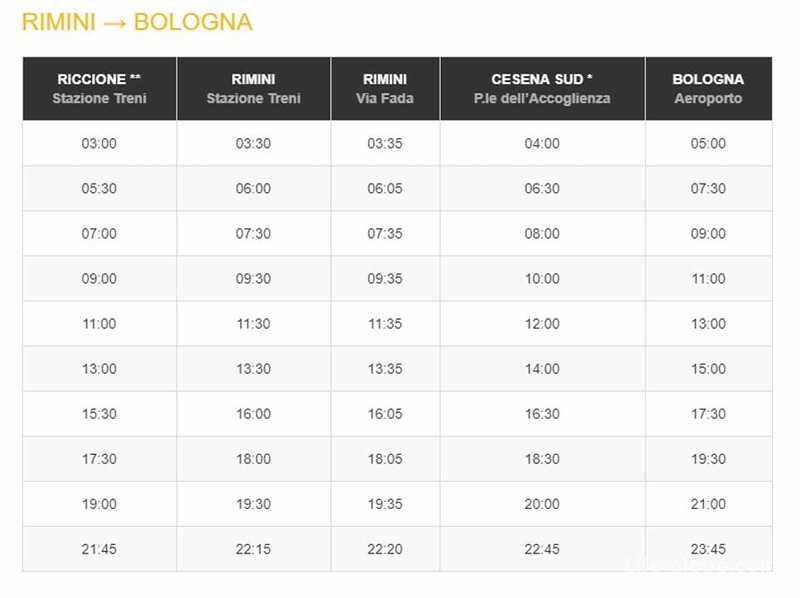 How to get from Bologna airport to Bologna city centre can be found here. From Bologna city centre to Rimini can be reached also on a taxi or a rented car. The optimal and perhaps the most convenient way to get by public transport from the centre of Bologna in Rimini and from Rimini to Bologna. 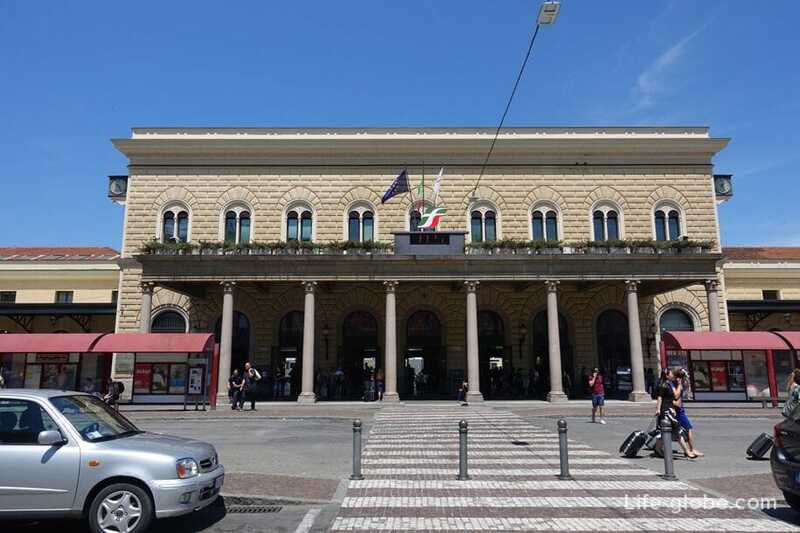 The train runs from the centre of Bologna, the railway station (Bologna Centrale) to Rimini railway station (Stazione Rimini). Travel time from 52 minutes, average 1 hour 26 - 1 hour 50 minutes. Tickets cost from 8.50 Euros, depending on trains and class of the car. For 9,85 Euros you can buy tickets for morning, afternoon and evening trains. Trains run every day: from Bologna to Rimini, from 05:00am to 23:52 PM; from Rimini to Bologna is approximately from 04:45 am to 22:04 PM. 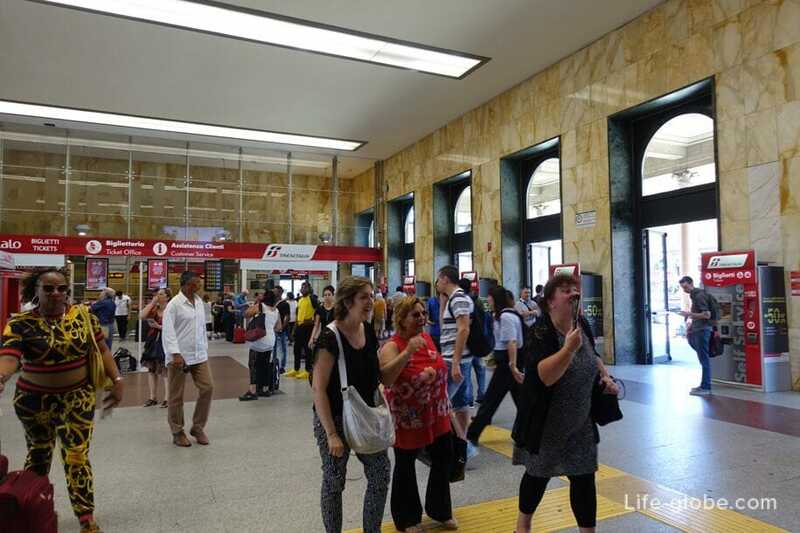 Find out the exact timetables and stops and cost of tickets on the Trenitalia website or online website Rail Europe. 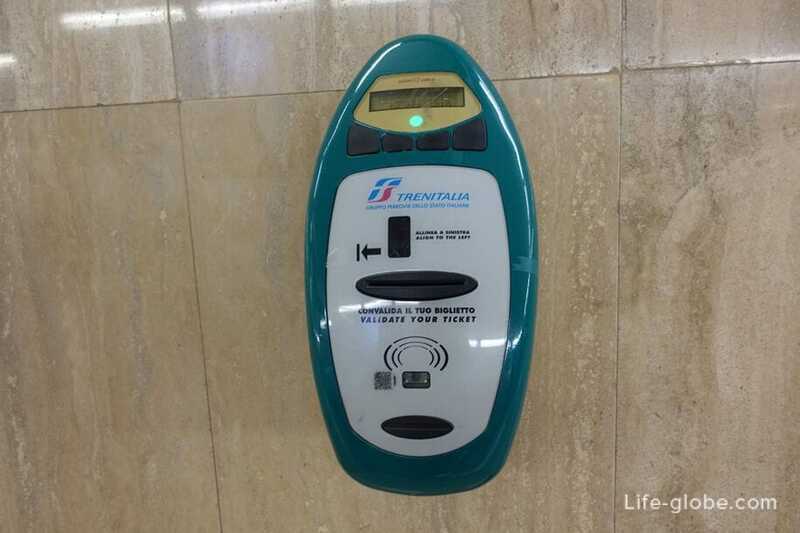 You can purchase the ticket at railway stations in vending machines or the ticket offices and also online. 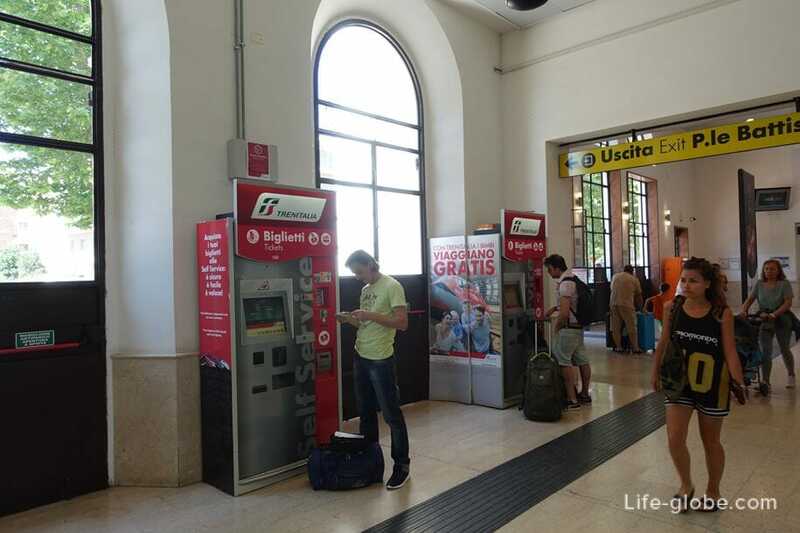 After purchase (before boarding the train) tickets must be validated in special stamping machines located in stations and on some platforms. 1. The bus company "Sati". 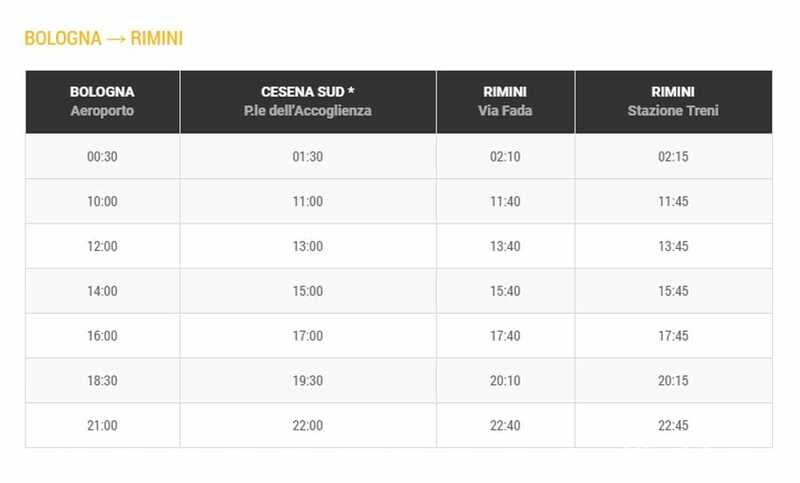 The bus runs once a day: - from Bologna departs at 15:40, arrives in Rimini at 17:50; - from Rimini departs at 12:30, arrives in Bologna at 14:50. From Bologna bus leaves from the bus station Autostazione, located close to the railway station. In Rimini arrives at the stop in Via Annibale Fada (coordinates: 44.049859, 12.582316). Back stay the same. 2. The bus company "Baltour". Bus passing: Pescara - Bologna. 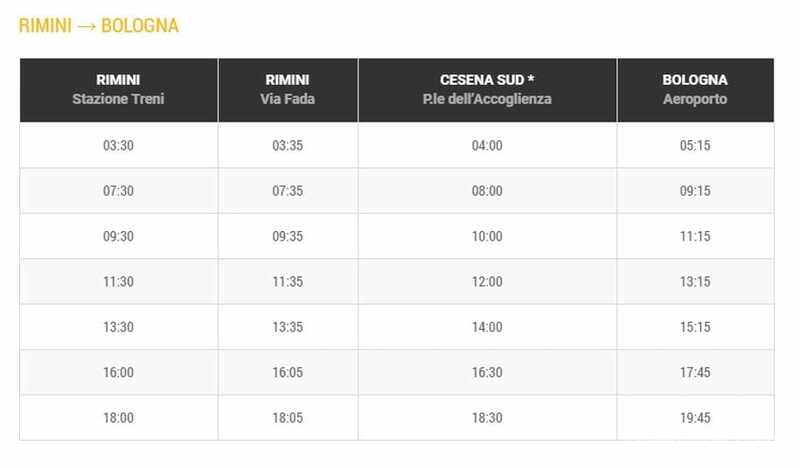 - from Rimini to Bologna: a) departure at 09:40, arrival time 11:20; b) departure at 16:45, arrival at 18:30. Departure from Bologna bus station. Stop in Rimini (arrival and departure) only Rimini, Uscita A14 Riccione Bar "il Trovatore", near the road and far from Rimini's centre and 12 km from the railway station.